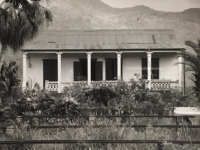 Hacienda Asunción is presumably the oldest remaining coffee plantation on the island dating back to 1821 according to information on the Government of Puerto Rico State Historic Preservation Office webpage Sitios Arqueologicos, Municipio de Yauco . Between 1860 and ca. 1880 it was owned by Eduardo Quiñones Vizcarrondo and originally consisted of some 600 cuerdas which were reduced to 400 after he became the suspect of sedition. The structures that remain which are in considerable good condition date from ca. 1875 and consist of the Manor House remodeled in 1901 and a two story Warehouse and Machinery House building in front of a medium sized cement "glácil". In a section underneath the warehouse there are 8 movabable drying pans. It is located on PR-374 Ramal Km 4.3. ​The pictures below are part of a 1987 study made by Archeologist Luis Pumarada O'Neill. Source: Puerto Rico State Historic Preservation Office.